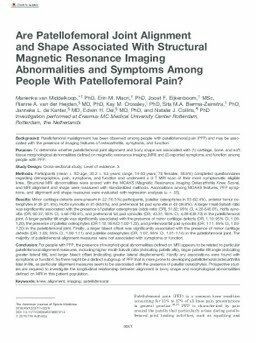 RePub, Erasmus University Repository: Are Patellofemoral Joint Alignment and Shape Associated With Structural Magnetic Resonance Imaging Abnormalities and Symptoms Among People With Patellofemoral Pain? BACKGROUND:: Patellofemoral malalignment has been observed among people with patellofemoral pain (PFP) and may be associated with the presence of imaging features of osteoarthritis, symptoms, and function.PURPOSE:: To determine whether patellofemoral joint alignment and bony shape are associated with (1) cartilage, bone, and soft tissue morphological abnormalities defined on magnetic resonance imaging (MRI) and (2) reported symptoms and function among people with PFP.STUDY DESIGN:: Cross-sectional study; Level of evidence, 3.METHODS:: Participants (mean ± SD age, 30.2 ± 9.5 years; range, 14-50 years; 78 females, 58.6%) completed questionnaires regarding demographics, pain, symptoms, and function and underwent a 3-T MRI scan of their more symptomatic eligible knee. Structural MRI abnormalities were scored with the MOAKS (Magnetic Resonance Imaging Osteoarthritis Knee Score), and MRI alignment and shape were measured with standardized methods. Associations among MOAKS features, PFP symptoms, and alignment and shape measures were evaluated with regression analyses (α = .05).RESULTS:: Minor cartilage defects were present in 22 (16.5%) participants, patellar osteophytes in 83 (62.4%), anterior femur osteophytes in 29 (21.8%), Hoffa synovitis in 81 (60.9%), and prefemoral fat pad synovitis in 49 (36.8%). A larger Insall-Salvati ratio was significantly associated with the presence of patellar osteophytes (odds ratio [OR], 51.82; 95% CI, 4.20-640.01), Hoffa synovitis (OR, 60.37; 95% CI, 4.66-782.61), and prefemoral fat pad synovitis (OR, 43.31; 95% CI, 4.28-438.72) in the patellofemoral joint. A larger patellar tilt angle was significantly associated with the presence of minor cartilage defects (OR, 1.10; 95% CI, 1.00-1.20), the presence of patellar osteophytes (OR 1.12; 95%CI 1.02-1.22), and prefemoral fat pad synovitis (OR, 1.11; 95% CI, 1.03-1.20) in the patellofemoral joint. Finally, a larger bisect offset was significantly associated with the presence of minor cartilage defects (OR, 1.05; 95% CI, 1.00-1.11) and patellar osteophytes (OR, 1.07; 95% CI, 1.01-1.14) in the patellofemoral joint. The majority of patellofemoral alignment measures were not associated with symptoms or function.CONCLUSION:: For people with PFP, the presence of morphological abnormalities defined on MRI appears to be related to particular patellofemoral alignment measures, including higher Insall-Salvati ratio (indicating patella alta), larger patellar tilt angle (indicating greater lateral tilt), and larger bisect offset (indicating greater lateral displacement). Hardly any associations were found with symptoms or function. So there might be a distinct subgroup of PFP that is more prone to developing patellofemoral osteoarthritis later in life, as particular alignment measures seem to be associated with the presence of patellar osteophytes. Prospective studies are required to investigate the longitudinal relationship between alignment or bony shape and morphological abnormalities defined on MRI in this patient population.